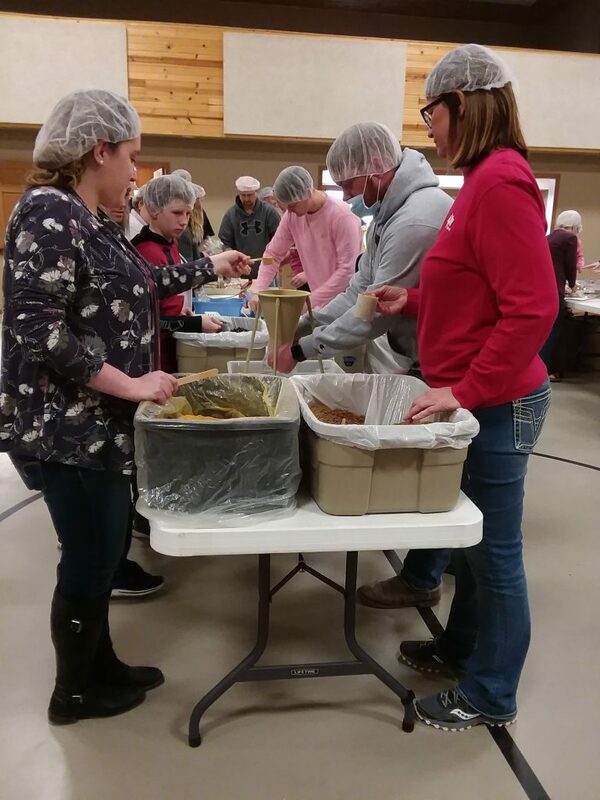 Eleven teams of 12 volunteers gathered at Lynnville Friends Church for three shifts of preparing packaged nutritious meals for Jasper County Take Away Hunger on Saturday, Mar. 23. The 11 teams were: 1st State Bank, Lynnville Friends Church Women’s Bible Study, Julie Jones and family, Lynnville Friends Church, Key Co-op, Lynnville Friends Church Small Group, Team Co-Line, Lynnville-Sully FFA, St. Andrew’s Lutheran Church of Sully, St. Stephen’s Episcopal Church of Newton, and First United Methodist/Holy Trinity Churches of Newton. According to Bill Bennett, president of Jasper County Take Away Hunger, 2019 is the tenth anniversary of the first packaging, which took place in November 2009. 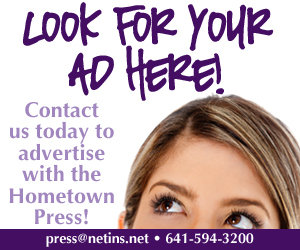 Three large packaging events are typically scheduled each year in spring, summer, and fall, and the Lynnville event was the first for 2019. LFC has hosted the spring event for the past six years. Additional events for small groups can be arranged throughout the year by contacting Jasper County Take Away Hunger through their website jctakeawayhunger.org or its Facebook page. Host groups supply sufficient work spaces and tables for teams of 12 workers, as well as access to electric outlets for the machines that seal the packages. Take Away Hunger provides the food supplies, packaging equipment, hairnets, and masks, as well as the training for the volunteers. The Jasper County staff consists completely of volunteers, including its board of directors. They are a unit of the larger Take Away Hunger organization led by Don Fields and based in Mount Pleasant, where all of the food supplies and equipment are stored for distribution to packaging events. Several Jasper County board members, in addition to members of Bennett’s family, were on site on Saturday wearing green shirts and providing assistance and restocking food supplies for the workers. Jasper County Take Away Hunger currently creates two types of packaged meals, where each bag contains enough food for six one-cup meals. The black beans and rice meal, packaged by the volunteers at LFC, contains beans, rice, and vitamin powder with a southwest flavoring. An international meal contains mixed vegetables instead of beans, soy, rice, and a chicken-flavored vitamin powder. Take Away Hunger’s food packages have been sent to reduce hunger in various places in the United States hit by disasters, as well as internationally. Packages were sent to Pella and Marshalltown following last summer’s tornadoes. Bennett summarized Saturday’s work done by 132 volunteers: 3,168 bags, each of which feeds six people, providing a total of 19,008 meals.